Celebrate the occasion in our private, picnic area, which includes volleyball courts, horseshoe pits, western town, antique farm equipment, playground, fishing pond, and campfire pits. Bring your picnic, wood, camp-sticks, or fishing poles - design your own outdoor experience. 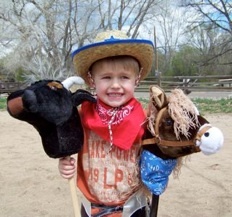 Two ponies are available for 30-minutes for children, ages 3 - 8 years, 65 pound limit. 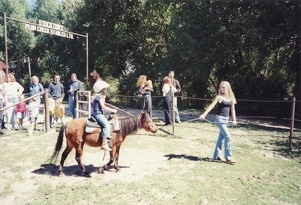 Parents lead the children in the pony-arena. Children wear helmets for safety. 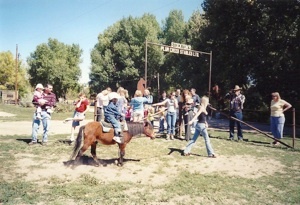 Upon request, ponies for ages 9 - 15 years, 130 pound limit, can be provided. Great fun for children that is absolutely unique to Stockton's. 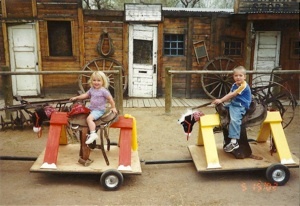 Six separate cars - each with a sawhorse pony, authentic saddle, yarn tail and cuddly felt head - are pulled by a miniature tractor through a trail in the picnic area for 30-minutes. Maximum safety, no weight limit, and accommodates 6 riders at any one time! Train is available for off-site parties; call for pricing. *Important Notations: Please call for further information, or drop by to see us. Children must be accompanied and supervised by an adult. Visa or Mastercard is accepted. Groups take responsibility for their own firewood and starting of the fire in the designated fire-rings. $175 cleaning fee will charged only if the grounds are not left in a tidy manner. Prices are subject to change, so call for current pricing. Guests are not permitted to bring pets, horses, or bicycles to Stockton's. Package is for total 2 hour time slot that includes setup and takedown time. Gratuities are welcome. Come celebrate and be a cowboy or cowgirl!! !